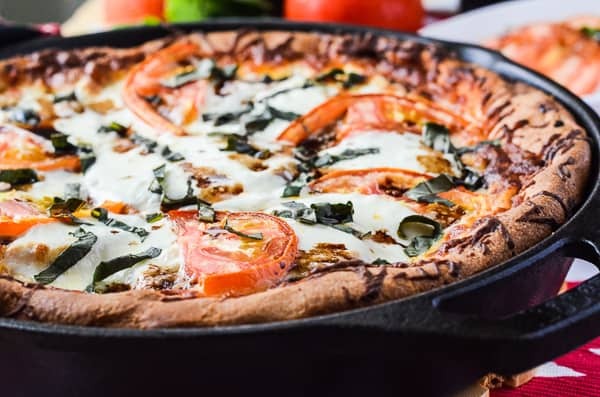 A delicious deep dish caprese skillet pizza, layered with crispy baked eggplant Parmesan, fresh tomatoes, spinach, & basil, and creamy mozzarella cheese. Who else loves pizza as much as I do??! Who’s down for some hump day pie action?! Friday night is usually when we order pizza in the Crumby House, but only about once a month. Almost to the day, actually, if you go in our Dominos account and look at our order history. It’s really kind of sad what creatures of habit we are. Hawaiian pan. Bacon thin crust, extra cheese. Jalapeno cheddar bread sticks. Bam. Every once in a while, we switch it up and get wings. Mindless ordering = mindless eating. Which is exactly what happens on those nights – they’re pizza, beer, and video game dates. And that works for us, but there’s nothing wrong with kicking lazy to the curb and getting down with some fresh dough and toppings in the kitchen together. 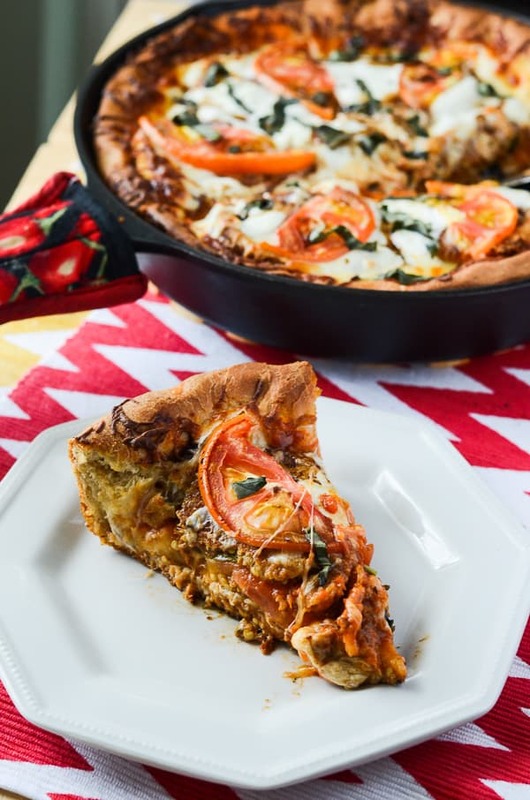 Aaannnnnd on that note, I think I’ve found the solution for the ultimate veggie pizza search in this Eggplant Parmesan Caprese Skillet Pizza! So, in case you haven’t been keeping score, I’ve taken part in the Sunday Supper Movement three times in the last few weeks [breakfast, lunch, dessert], and my contributions have been pretty well-received. Which makes me sooooo over-the-moon happy, you don’t even know. I love the idea that I’m possibly helping a family gather at the table for a Sunday dinner together. After a busy week of school and work, it’s so important to reconnect over a good meal before the monotony starts all over again. But what if…what if you could have that family togetherness every night of the week? Weekday Supper rests on the same principle as Sunday Supper, so it was obvious that being a part of it, also, was inevitable. 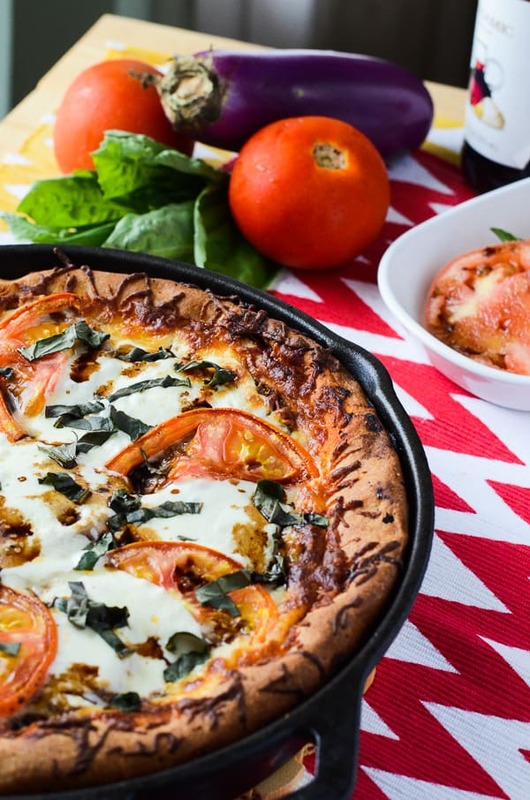 I’m super excited to present this homemade caprese skillet pizza as my first #WeekdaySupper offering! Skillet pizzas are DA BOMB. They’re super quick and easy to throw together, which means no excuses to not make one, like, today. Just press in your dough, toss on your toppings – or layer them delicately, if you’d like – heat on the stove a few minutes, then bake. In about an hour, you can serve your family a hot, fresh, perfect pizza that I guarantee didn’t cost you as much as delivery would. Have you seen that stupid delivery fee? And then you have to tip on top of that? What’s the fee for, then??? 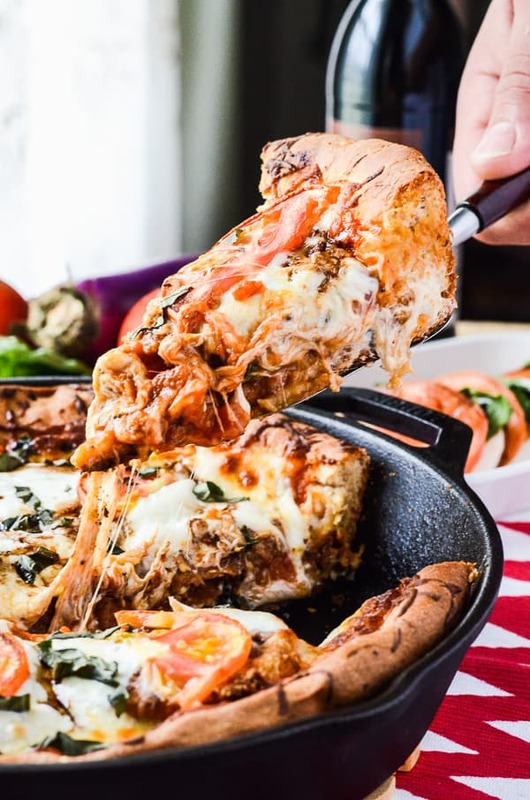 If you think you’re the expert on getting a crunchy crust on a pizza pan, well…try getting a crunchy deep dish crust without a cast iron skillet. I’m a forever fan of caprese salad, and thanks to good ol’ Martha, I’m a recent eggplant parm lover. Matter of fact, Mr. Crumby prefers my (version of) eggplant parm to any lasagna I’ve ever made. He requests it pretty often, and who am I to say no to something healthier for dinner? The layering of this pizza very much mimics that of Eggplant Parmesan. You start with a layer of the most delicious baked eggplant. And then, there are layers of tomatoes, spinach, and sliced mozzarella. And layers of marinara sauce. And more layers of cheese. Are you sensing a pattern? It’s all about the layers, people. Layers that lead to this amazingly complex yet simple thing we call a pizza. You won’t even need a fork for this meal! And you wouldn’t believe how good this is the next day, heated up in the toaster oven! It is leftover pizza, after all. Drizzle 1 Tablespoon of olive oil in a cold cast iron skillet. Set a ball of pizza dough in the skillet and move it around in the oil, spreading it to coat the skillet and the bottom of the dough. Let the dough sit and rise while you prep your eggplant. Preheat oven to 375 degrees F. Brush a baking sheet with olive oil and set aside. In a small bowl, whisk together egg and water. In another bowl, combine breadcrumbs, Parmesan, and Italian seasoning. Pat eggplant dry on paper towels; dip slices in egg mixture, then dredge in breadcrumb mixture, coating well. Place on baking sheet and bake about 12-15 minutes, or until golden brown on bottom. Turn slices and continue baking another 12-15 minutes, until the other side is evenly browned. Remove from oven, and raise oven heat to 450 degrees F.
Press the dough evenly in the bottom and around the edges of the pan, pulling it up the just below the rim. Layer ingredients as follows: 3 Tablespoons marinara sauce and 6 slices of eggplant; 1/2 cup marinara sauce and shredded mozzarella; 6 1/4-inch slices of tomato and some baby spinach; remaining marinara sauce and 6 more eggplant slices; 6 half tomato slices, 8 half mozzarella slices, and Parmesan cheese. Cook the pizza on the stove top over medium-high heat for 3-4 minutes. This allows the bottom crust to become super crispy! Bake in preheated oven for about 15 minutes, or until the top crust is a lovely light brown color, and the cheese is melty. Remove from oven and sprinkle basil ribbons on top. Now, you may either place the pizza under the broiler for 1-2 minutes to brown the cheese and dry the basil, or you may leave the basil fresh. 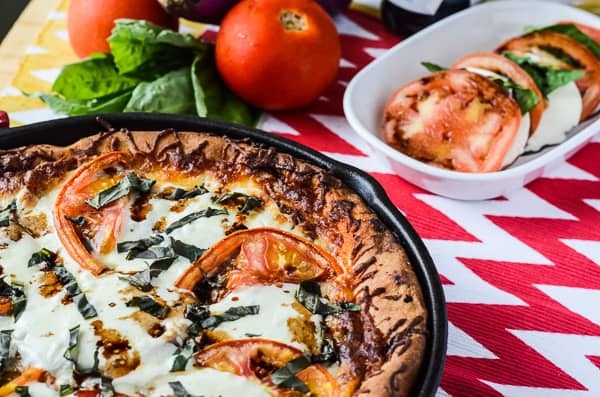 Drizzle balsamic vinegar on top of the pizza when ready to serve. Enjoy! 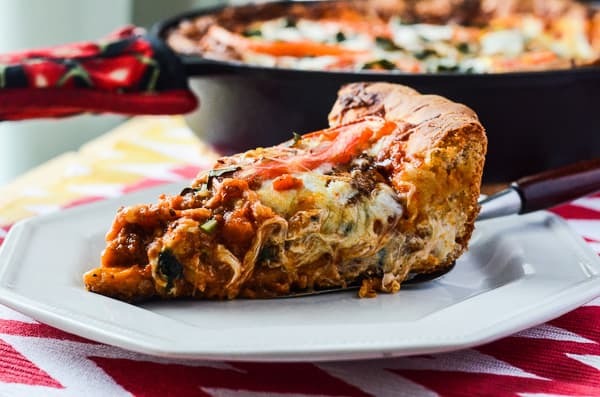 How would you top your dream deep dish pizza? Check out the rest of this week’s Weekday Supper Summer Produce recipes! If I’m going to eat pizza, you can bet it’s going to be worth every carby, cheesy calorie…and this one TOTALLY 100% IS WORTH IT! I really need to get a skillet now! 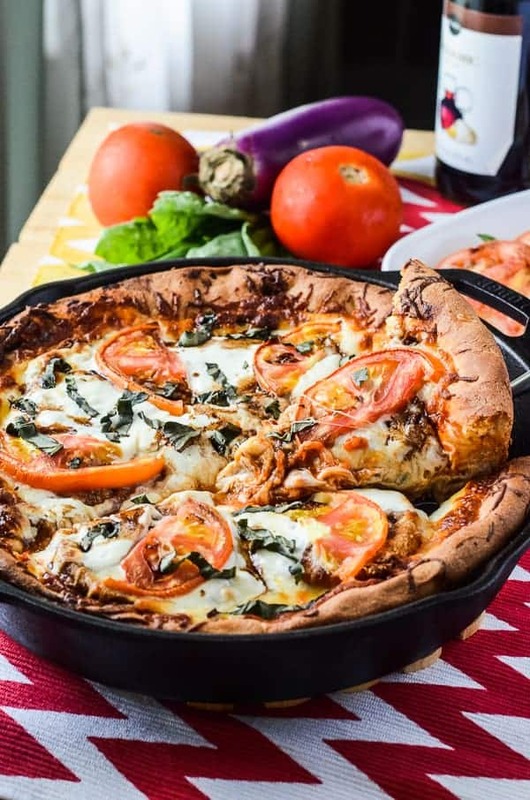 I have never tried to make a deep dish pizza before and this one looks delicious! I think using fresh produce really makes a difference to whatever meal you’re making, and I always feel so much better knowing my boys are eating wholesome food! Now I’m hungry! This looks delicious!! Cooking with eggplant has kind of intimated me but I love to order it when we eat out. I love that this is made in a just a skillet looks like it would be easy to whip up. Your family sounds like mine. We are also creatures of habit when it comes to ordering pizza. Papa John’s is our favorite. We haven’t made pizza at home in quite a while. This one looks delicious. Pinned it to my Iron Skillet Cooking board and plan to give your recipe a try. This looks absolutely amazing! I am definitely going to save this recipe and give it a try. I love ordering pizza, but this post makes me want to look into making it myself next time. It would be nice to know exactly what is going into my food! This pizza looks insanely good! Eggplant parm and pizza together in one sounds like Friday night dinner to me! This looks absolutely delicious! I LOVE pizza! Oh my! This looks absolutely divine!! I love anything with eggplants involved! I really love how nice and easy it is too! Pizza is a regular for us over here! 🙂 How great!! Thanks for sharing! Looks lovely!! That looks really good! I have never tried making a dip dish pizza, but after seeing this, I’d love to try it. This one seems easy to do. My family loves pizza and I want to surprise them this weekend. Thanks for the recipe. I had to pin this delicious pizza. We like trying new kids of pizza topping every week on Friday when we have our Friday family pizza night. Thanks for taking the time to share this. YUM!! Hello! I love your blog. The photographs and content are amazing. I made a cooking blog that may appeal to you. I would greatly appreciate it if you would check it out. http://kcolescreativecorner.com Make sure to sign up for the email subscription on my website if you would like email updates on new posts! Thank you! Truthfully, I’ve never tried eggplant. But I think this is the recipe that will get me to try it! It looks so yummy! Dude whoa!!! I bet you never call for pizza delivery, not when you have such a delicious recipe in your recipe rolodex! This looks SUPER YUMMY! I may have to try it one day! I was thinking that I need to find some fun pizza recipes for the kids and I to make during the summer. They love putting the topping on especially the cheese. I like eggplant especially with cheese. This is definitely a recipe I will be pinning and trying. The photos are all mouth watering. This looks so good. I bet it tastes delicious. this looks DELICIOUS. I would have never thought to incorporate eggplant into pizza. Brilliant idea! Wow! It looks very tasty! I’m not sure I could make this. I would get distracted as soon as the eggplant was ready. I love to top it with raw or sauteed garlic and feta cheese, roll it up and sprinkle with lemon juice. I will pin this in case I make enough eggplant to have leftovers. I have ordered pizza with eggplant but found it too greasy to enjoy. Your recipe would fix that problem. I will stay with your blog for a while to see what other delectables you have shared.